Aneurysms of the posterior cerebral circulation account for only about 15 % of all intracranial aneurysms, and surgical treatment of these aneurysms was demanding until the introduction of endovascular therapy. The surgery-related morbidity and mortality—about 10 % in the best published series—was correspondingly high. One must assume that in the average series, the surgery-related morbidity and mortality may have been about 30 % or higher. Part of the high complication rate can be linked to the relative rarity of these aneurysms, because the particular approaches and techniques require special skills and awareness of specific pitfalls. 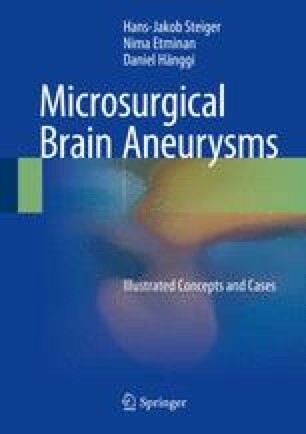 Another reason for the unsatisfactory results of microsurgical treatment, however, has certainly been the highly eloquent territory supplied by the parent arteries of these aneurysms—that is, the brainstem. Drake and Peerless from London, Ontario, acquired the world’s largest experience in the surgical treatment of aneurysms of the posterior circulation.